Richard and Suzanne Wood have both worked in the composites industry for many years. They joined forces in 2009 and have refocused Construction Composites to specifically serve the construction industry with this exciting, non-traditional building material. They are inspired by the prospect of composites becoming an established option for construction professionals. The biggest change to the way Construction Composites delivers its projects is much more collaborative working. Contractors will have a need or an idea and they will work with Construction Composites, using the team’s skills and knowledge of the materials, to jointly deliver a better solution to the client. More prefabrication, lighter weight structures, less reliance on steel and concrete. Research and development has to address the chronic shortage of housing with new and innovative solutions. As much of what Construction Composites delivers is already prefabricated, we are creating products that are relatively quick to install, safer due to the weight difference, attractive with a wide range of surface finishes, durable and long-lasting. The company has invested in technology to enable rapid production of components for construction and civil engineering projects. 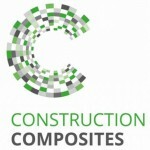 Clients’ requirement for supply chain accreditation drives Construction Composites forward. In order to compete effectively, much work has been done to ensure compliance and gain appropriate accreditation. The opportunity to work with clients outside the South East and London has increased as information is able to be transferred easily via electronic systems. This results in less site visits and quicker quotation preparation, saving time and costs.